Tag Archive | "Jay Jeffrey"
Jay Eugene Jeffrey, of Cedar Springs, Michigan, passed away at his home Thursday, August 16, 2018. He was 78. Mr. Jeffrey was born February 4, 1940 in Highland Township, Osceola County, Michigan to Vern and Gladys (Britton) Jeffrey. 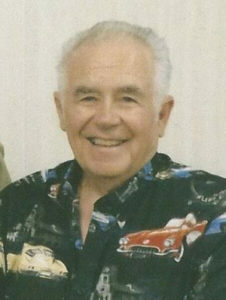 Jay graduated from Evart High School in 1959. He married Barbara Poterack on February 14, 1969 in Wyoming, Michigan and she preceded him in death August 17, 2005. They both enjoyed traveling and had a passion for car racing. He spent most of his life in the Grand Rapids area. Jay was a lifelong mechanic. He enjoyed fishing with his family and was a member of Red Pine Bible Church in Kent City. Jay loved to tell stories and always laughed because most of them weren’t true. If everyone went out to eat, Jay would usually forget his wallet, then laugh because he got away with it. Mr. Jeffrey is survived by two sisters, Virginia (Chuck) Rose of Boulder, Colorado, Marilyn (Ron) Struble of Sears; two brothers, Robert Jeffrey of Clio, Jack (PJ) Jeffrey of Evart; long time special friend, Sandy Fleischmann of Cedar Springs, and several nieces and nephews. He was preceded in death by his parents, Vern and Gladys Jeffrey, and his wife of 36 years, Barbara. Funeral services honoring Jay Eugene Jeffrey was held at 1:00 p.m. Tuesday, August 21st at the Corey Funeral Home in Evart, with visitation 6:00 to 8:00 p.m. on Monday, August 20th. Jay will be laid to rest next to his wife in Greenwood Cemetery near Marion, Michigan.